Last year we posted a free VBS curriculum written by Tara Tegard called “Bible Boot Camp VBS.” It is still available for download and hundreds of churches have used it in their ministry. Tara has written a second Vacation Bible School curriculum and wants to share it with readers on our website. 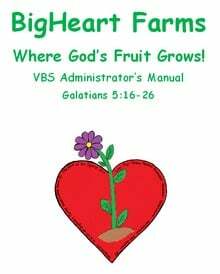 It is titled “BigHeart Farms” and covers Galatians 5:16-26, the Fruit of the Spirit. There are two files to download, for each you can choose a PDF or DOC format that can be edited with Microsoft Word. Music Suggestions: Here are some music resources that we’ve hear people using with these lessons. Our website has many free resources to help you plan Vacation Bible School. Here are a few that would be most relevant to this free VBS. We would love to hear how you use this material in your ministry. Please leave a comment to share your stories or make suggestions for further improvement. Thank you. We used your curriculum for VBS this year. We tweaked it to fit our small work force and had a very successful VBS. Thank you for making it available. Love your vbs material. We used the Armor of God this year and it was great. Did a little tweaking and adding. Working on maybe doing Fruits of the Spirit. Wondering if you have a Moto in mind for it. Thanks and God Bless. we have a Saturday Outreach Feeding program in our church. Before feeding the neighborhood kids, We teach them God’s Word. I have run out of ideas and was thinking of either doing armor of God or doing this. This is a great help. Thank you for this! You are a great help to busy, weekend, ministry workers. May God continue to endow you with wisdom and creativity in reaching out to the whole world. God bless! Tony Kummer (Editor) reviewed & updated this page on : February 6, 2013 at 8:43 am. All our content is peer reviewed by our readers, simply leave a comment on any post suggest an update.